Logan Elm School Board Member Michael Linton and Rane Reeds, both of Accurate, have teamed up with the Washington Elementary 4thGrade to take part in Project Based Learning (PBL). Today, they visited the 4thgrade classes to talk about blueprints for a house and the different types of heating/cooling systems houses may have. The students and teachers were using their minds to challenge themselves and each other.We were excited to welcome our guest speakers and a new way of learning! The bond will generate funds to construct a new building divided into three school zones. 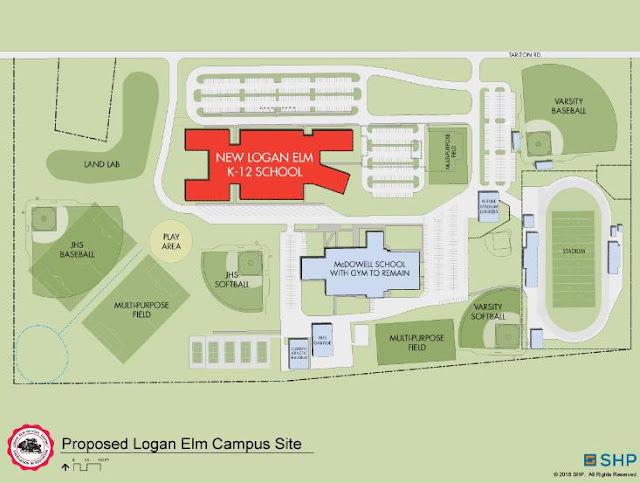 The building will feature separate areas for elementary, middle school and high school students.The school will be located at the site of the current high school and middle school. Over the past two years, the District has worked on upgrading the aging facilities at the proposed campus without asking for more tax dollars. A few of the upgrades include a new septic system, track surface, and outdoor lighting.The McDowell building will remain open and serve as a resource for the district and community. Spangler Memorial Gymnasium will continue to be used for various athletic events. District offices will remain at McDowell.The anticipated opening, if passed on November 6, 2018, is the 2022-23 school year. My name is Ted Dille, and I am the proud principal of Salt Creek Intermediate School. I hope that you and your family have had a wonderful summer. As a graduate of this great district and alumni of Salt Creek, I am excited to work with you in providing an outstanding educational experiences for your child(ren). Whether your child is a new 5th grade student or a returning 6th grade student, I want them to have a fun-filled school year where they will be challenged to grow both in their academics and character. Thursday August 16th- Open House will take place from 5:30 PM to 7:00 PM. All students and parents are welcome. School supplies can be brought in during this time as well. Transportation tags will be available for pick-up during this time. If you are unable to attend, the transportation tags will be given to the student from their bus driver on the first day of school. Please join us in welcoming six new staff members to Logan Elm. We are excited to have them join our Brave family! Pictured: Front Row--Jennifer Perkins, Secretary at Salt Creek Intermediate; Jessica Morgan, Language Arts teacher, Logan Elm HS; Tami Clark, Principal, Laurelville Elementary. 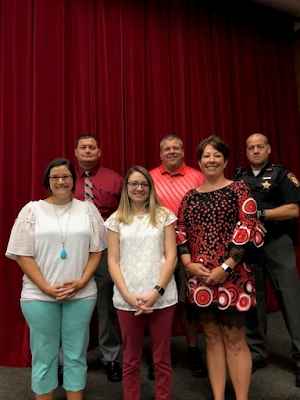 Back Row--Andy Gaffis, Dean of Students, Washington & Pickaway Elementary; Jason Shepherd, Social Studies teacher, Logan Elm HS; Deputy Phil Relli, Resource Officer, Pickaway County Sheriff's Office.